This is an overview of how to import LinkedIn connections via CSV to Nimble. To bring your connections to Nimble, you will need to follow these steps. Step 1. On LinkedIn, export your connections to a CSV file from this link. 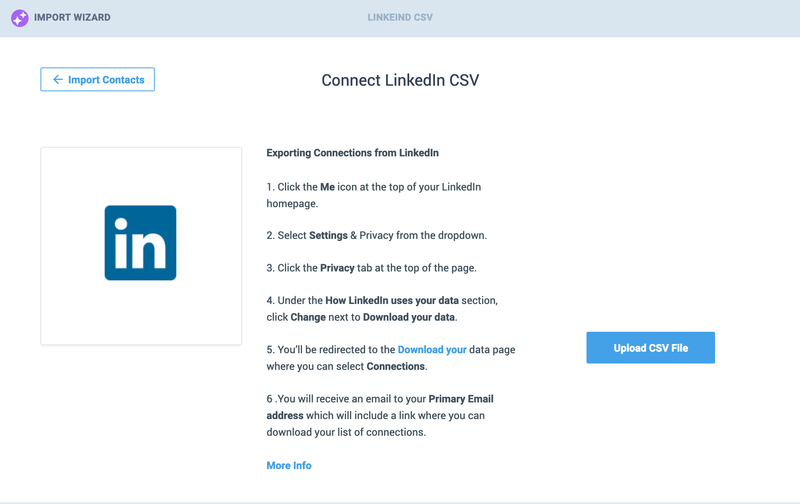 Under "Download Data", select "Pick and Choose", and then "Connections", to receive an email containing the CSV file of your LinkedIn contacts. Step 2. After requesting and receiving your data export, download it and look for "Connections.csv" for import to Nimble. Step 2. Sign into your Nimble account, and go to Settings >> Networks & Imports. Step 3. Select "Linkedin" and use our CSV Import Wizard to upload your file to Nimble. Our import wizard will guide you through the process of matching the headers from the CSV file, to fields that exist in Nimble. Step 4. Make sure to apply a tag to your import during Step 3 of the import wizard, so that you may easily locate your LinkedIn contacts within your Nimble account! What data will be added to my contacts? All data in the CSV file will be added to your contacts. This will include the contact's first name, last name, job title, company name, and the date and time you connected on LinkedIn (you can create a Custom Data Field to import the connection date!). LinkedIn does not include profile URLs in their CSV file, however Nimble can use the information you already have for your contacts to try and find the profiles automatically for you as you visit each contact record in your account! Alternatively, you can add the profile URLs to your CSV file manually and import them to Nimble along with the rest of your contacts' data. Learn more here: Can I import my contacts' social accounts via CSV file?